A wind damaged roof usually if severe enough will also constitute replacement by your homeowner’s insurance policy. Wind damaged roofs can develop into severe problems if not addressed quickly. The most common mistake is when the shingles blow off, leaving a black layer known as tar or felt paper exposed. 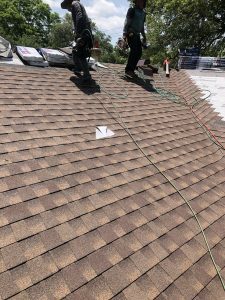 This felt paper is full of holes and is not designed as a safety layer if the shingles come off. Felt paper’s purpose is to prevent moisture (in the form of condensation) from seeping into the plywood decking, and over time causing the deck to dry rot.